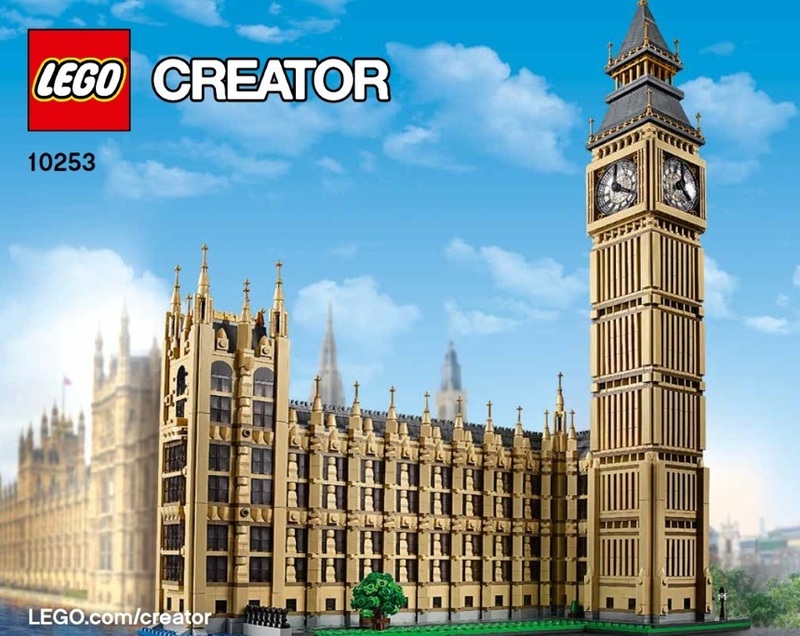 Lego’s own Creator model of Big Ben and the Westminster Palace facade is a gigantic wonder: 4163 bricks and 17 inches wide. The Elizabeth clock tower and clock assembly are beautiful. So, why build and light a smaller version? The Creator model is quite expensive ($250), much too large for the space I have, and … well, I confess, I detest mini-figures and the statues on the main building facade are row upon row of mini-figures which, for me, add a cartoonish aspect to the structure. 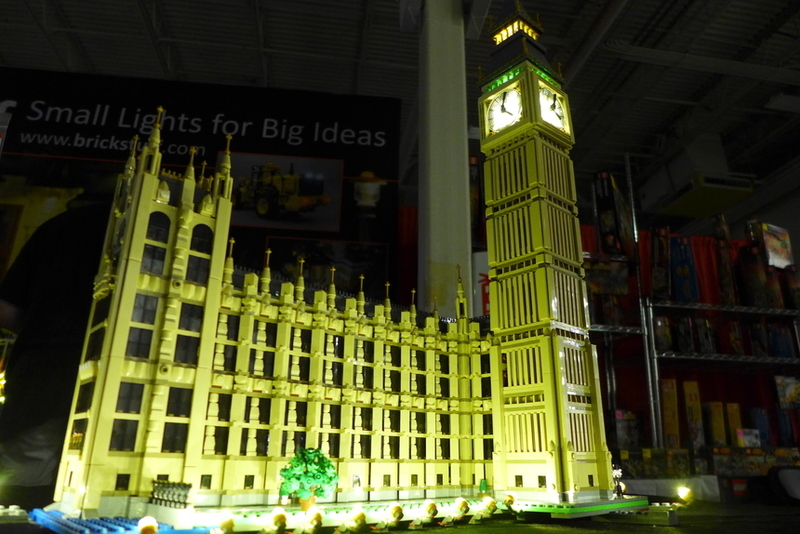 Of course, the Lego Creator Big Ben lights beautifully—particularly with Brickstuff lights inside and outside the building. 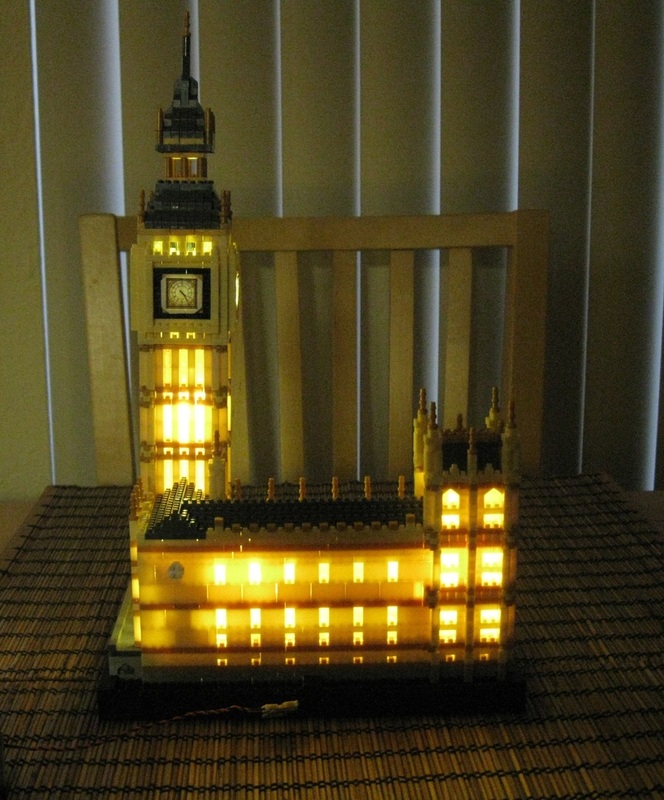 So, I decided to build, customize, and light the nanoblock-sized Balody Big Ben: 3600 bricks and 8 inches wide. The Balody model from China is the largest and best-looking of the various nanoblock-sized sets available. I hoped to improve its appearance, where possible, and do a decent job of lighting the model with Brickstuff LED’s. 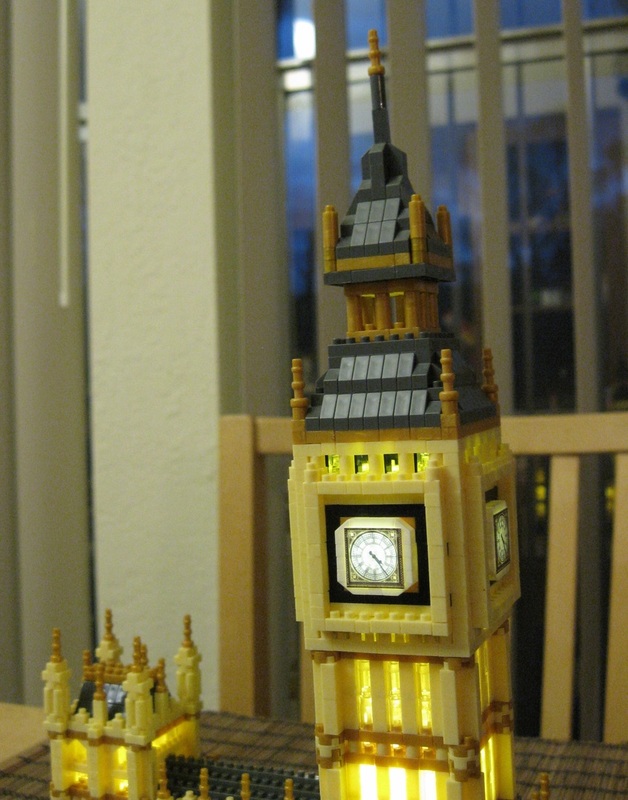 The lit Lego Creator Big Ben became the gold standard I was striving toward. 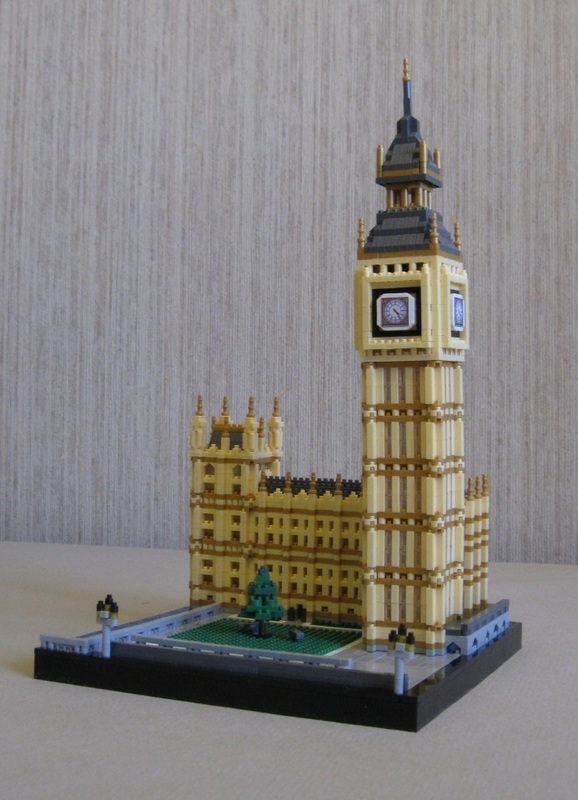 Oddly, the Balody Big Ben is built on a square base: 8” by 8” (50 stud by 50 stud). 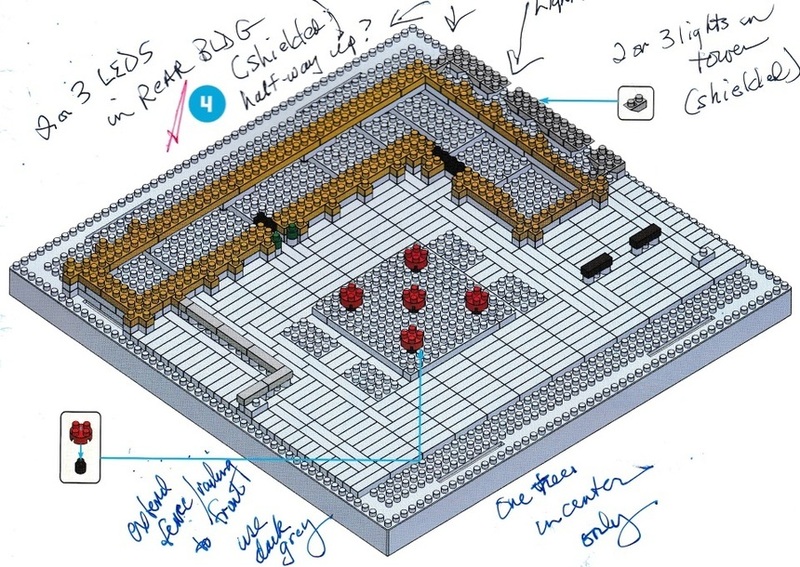 A rectangular base—as with the Lego Creator model—would have made more sense. If I had it to build over again, I’d probably create my own rectangular base to use instead of the one-piece square black base Balody provided. 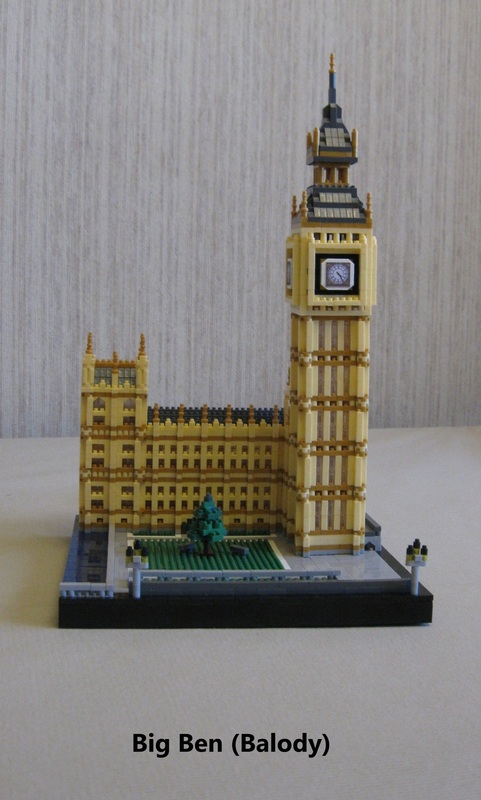 Another unfortunate result of the square Balody base is that the facade of Westminster Palace is narrowed to six sections instead of the eight in the Lego Creator version. 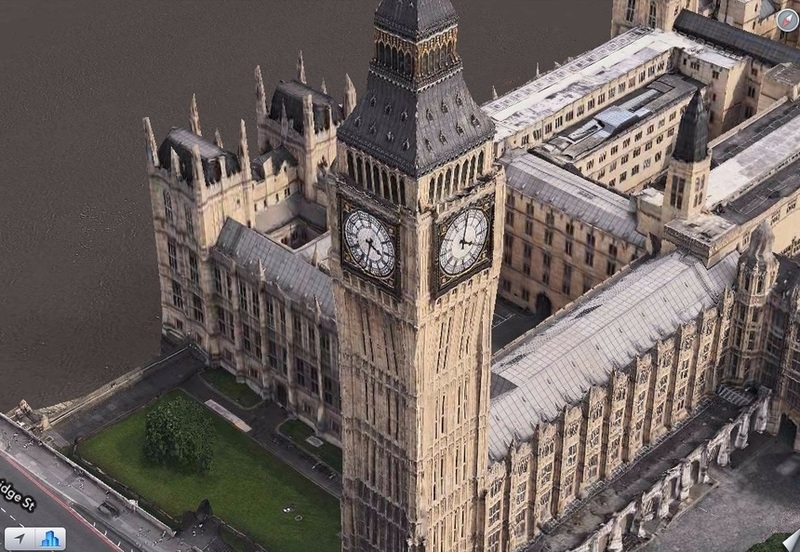 I perused photographs of the land around Big Ben in order to plan a simpler build of the base around the building and one more like the real thing. Balody added some odd, unconvincing flora and used green tiles for grass. 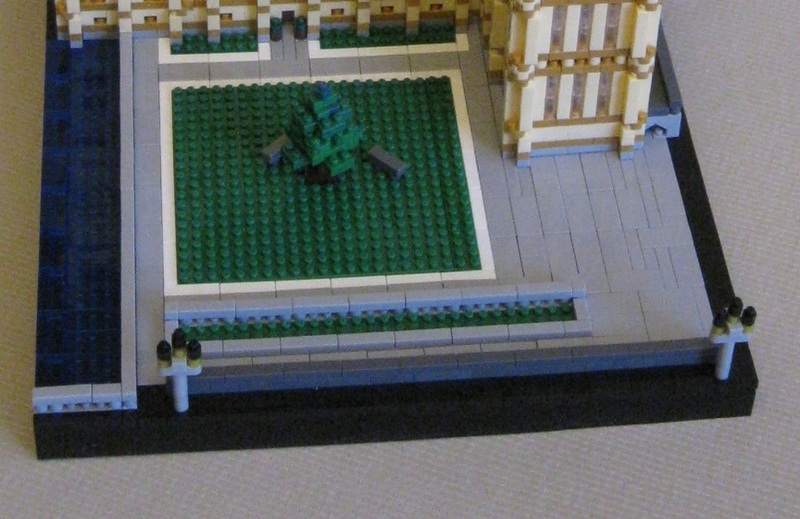 I moved the building backward on the square base, replaced the green tiles with green studded bricks, expanded the lawn and walkways, added a simple tree with two benches, lengthened the Thames on the left side, added additional fencing and created walls bordering the front of the open areas. 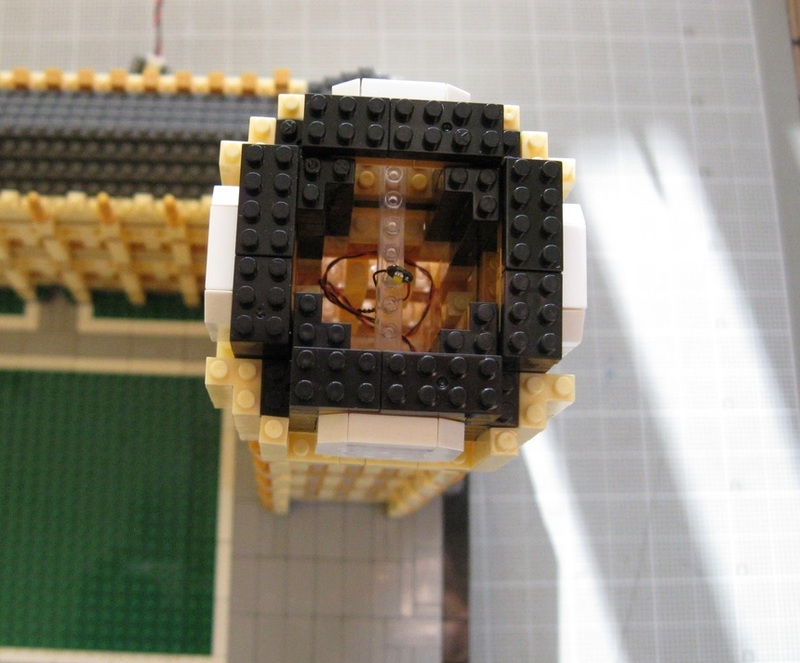 Brickstuff lights can easily overpower the thin walls of nanoblock bricks. 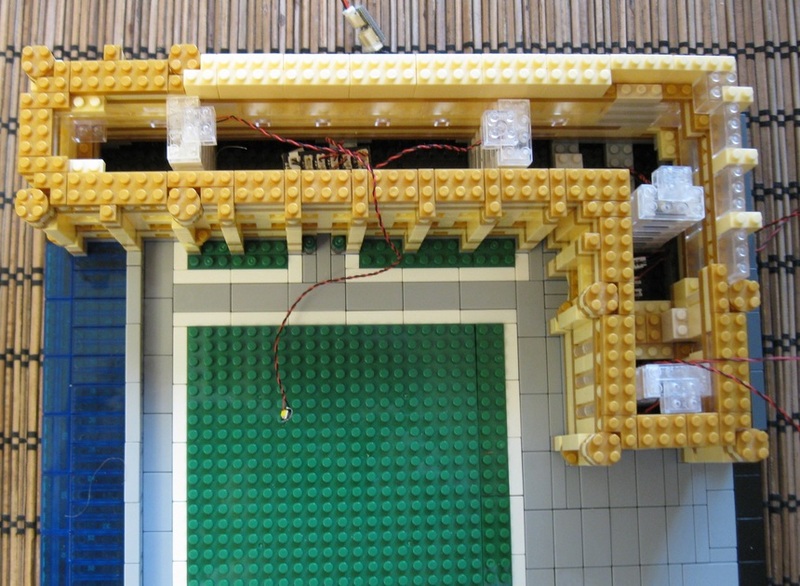 So, shielding each LED with transparent and opaque bricks and tiles is essential both to prevent over-lighting and to channel the light in the wanted directions. Here are a few examples. Unblocking light is another essential goal. To allow the light from the LED's to travel unimpeded both horizontally and vertically, structural changes were necessary and replacement of solid bricks with transparent ones or with none. The following three examples from the instruction manual illustrate. The first image shows black bricks which block light from exiting doorways. They were replaced with clear bricks. The second image shows one level of the clock tower on which tall tan bricks are blocking light from shining out through nine clear pillars—necessitating changes which had to be repeated for every “floor” of the clock tower without introducing too much wobbliness. 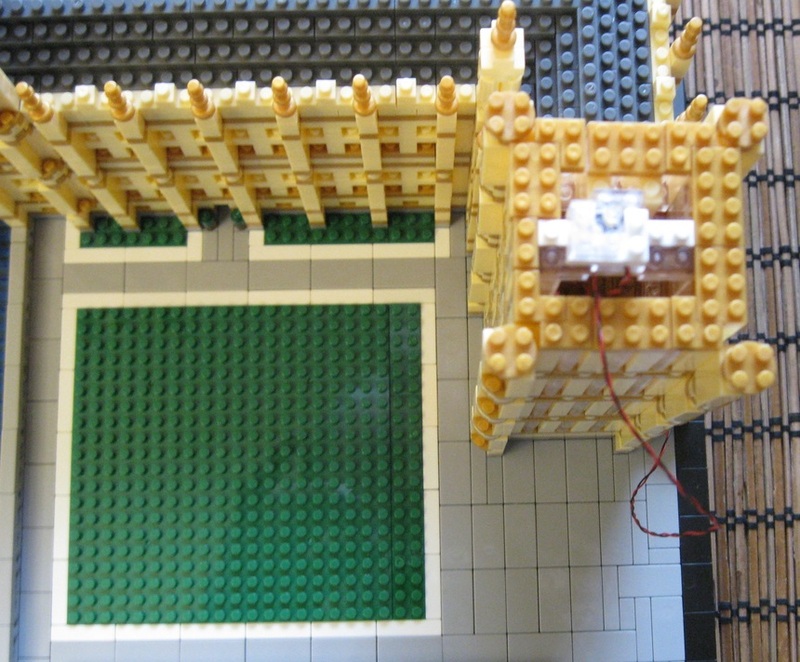 The third image shows a late stage in the construction of the clock tower in which an opening must be created in the dark bricks in step 85 to allow light to travel upward and out through the gold pillars in step 87. A trickier goal of lighting Big Ben is to strive for balance in the brightness of the lights both across the Westminster Palace and up levels of the Big Ben tower. 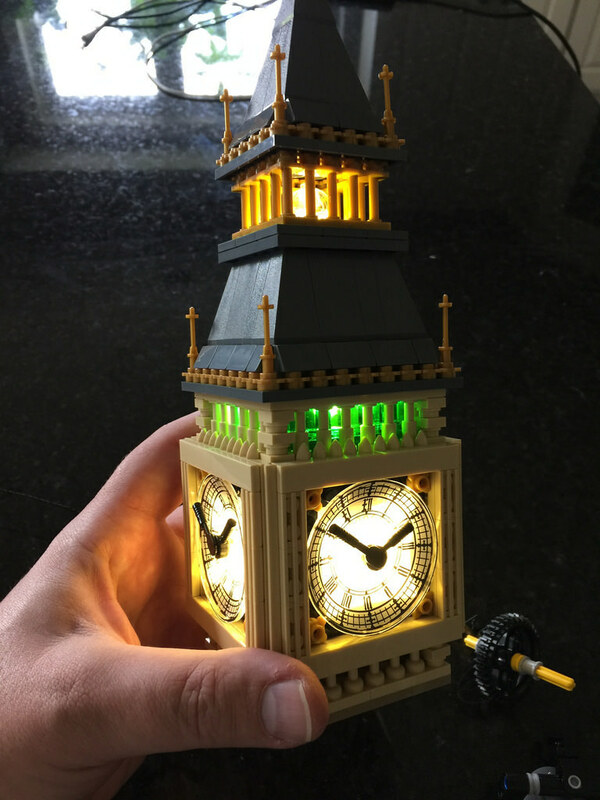 The clock at the top of the Elizabeth Tower in the Lego Creator Big Ben is simply stunning with its removable top, Big Ben bell, movable clock hands, detailed clock dials, etc. There is simply no way the very small clock section at the top of the Balody model can capture all this detail. I simply focused on making the clock look reasonably convincing. Balody provided four stick-on decals for the clock. Not being satisfied with their look, I came up with a different idea. I printed out reduced images of the actual Big Ben clock face and printed them out on matte printer paper. This took some experimentation to find the right paper thickness for appearance sake and to allow the clock face to be illuminated but not overwhelmed. These four clock images were then glued to the four white “frames” around the tower. I altered these frames by inserting transparent bricks into their centers. One last Pico LED was threaded up the tower and strung around a transparent nanoblock crosspiece so as to hang suspended and centered between the four clock faces. 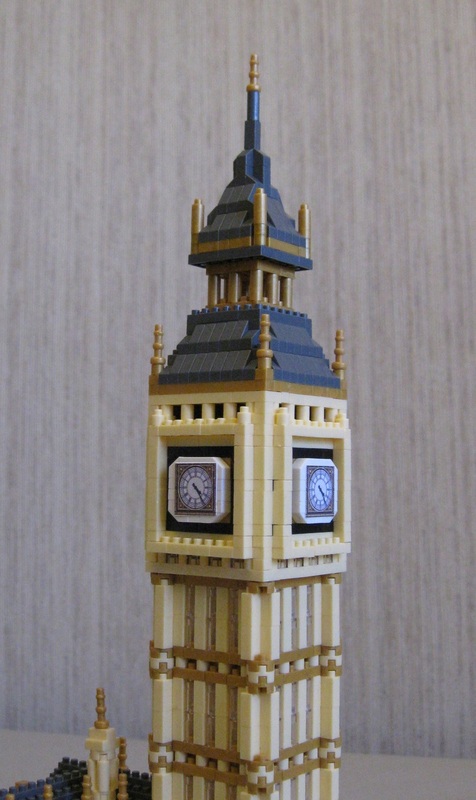 I am generally pleased with the final look of the Balody Big Ben. It looks better than the model on the box cover. 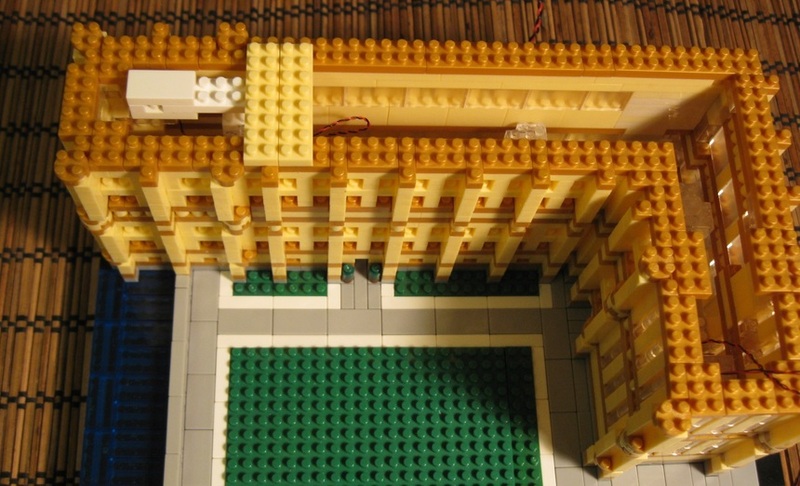 Many nanoblock models of buildings—including the recent Tico model of the Smithsonian Castle—have a “prison look” about them due to their lack of curved and arched bricks and the preponderance of tiny square windows and doors. The Balody Big Ben does a little better in this respect. There are actually a few arched doorways and window openings. The lighting with seven Pico LED’s was generally successful.. I was unable to totally balance the brightness of the illumination across all levels of the Elizabeth Tower and all sections of the Westminster Palace facade. Here are a few photos. The rest—including some build shots—can be seen in my Google Photos album here. Comments are welcome. As always, a great job and I love your customizations-- I agree the model looks much better with your changes. 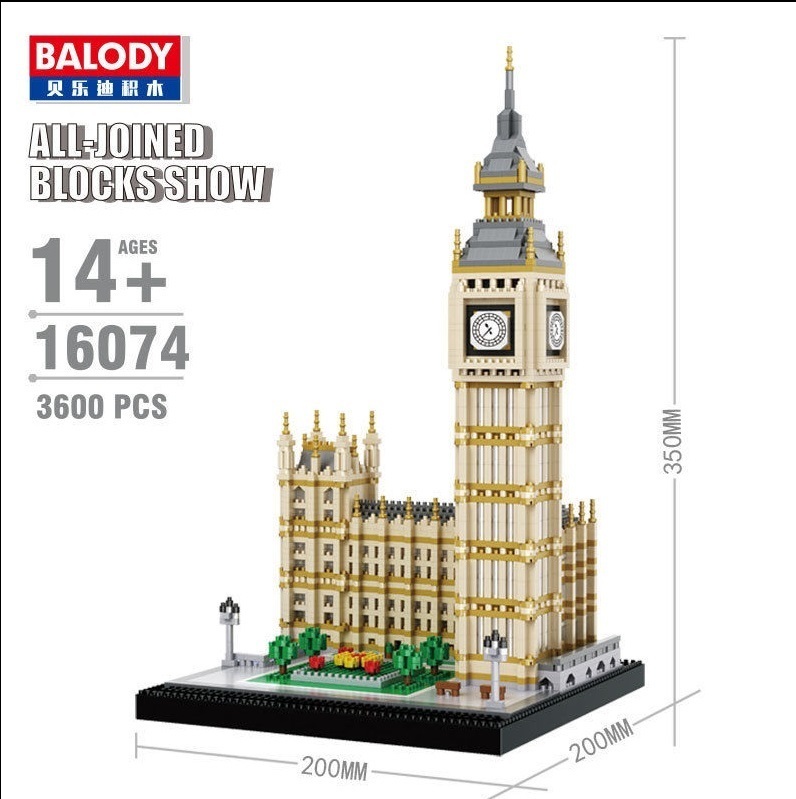 Looking at the Balody bricks, they seem to at least be a little better than the Nanoblok bricks because they have some round-ish bricks, so Big Ben indeed looks more like a clock than a prison. :-) Thanks as always for sharing your lighting approach, and the printed clock also helps a ton to make the model more realistic. Well done!